As you may or may not know, I have worked for the past four and a half years at Boncom, an advertising agency in Salt Lake City. I've worked as a brand strategist (or account planner, in industry lingo), focusing on cause-oriented clients like Huntsman Cancer Institute, Deseret Industries and Envision Utah. In addition to serving non-profits and purpose-driven clients like these, Boncom is also the agency of record for the Church's Missionary department. As such, the agency has produced the I'm A Mormon campaign, Mormon.org, the He Is The Gift campaign, the #BecauseOfHim campaign and other missionary-focused work. I personally have had limited involvement in these campaigns simply because my particular position deals more with new clients' needs, but it's been my honor to work with dedicated, creative teams who have contributed to the Church's growth over the past years I've been there. Today I gave my two week notice, and I will no longer work at Boncom starting February 4th. I have been offered the position of chief marketing officer at Brain Chase, an exceptionally fun and exciting start up founded by a business school friend of mine and my husband's. Brain Chase is a 5-week summer learning adventure for kids in grades 2 through 8. Disguised as a massive global treasure hunt, Brain Chase kids complete online academic assignments each day which unlock animated webisodes that reveal the location of a real life buried treasure somewhere around the globe. The kid who pinpoints the treasure's location first travels to dig it up and win $10,000 in scholarship money. If you have elementary school kids, this will be my one pitch to you: visit Brain Chase and consider it for your kids this summer to combat summer learning loss. Why should any reader of this blog care what my day job is? I share the news here because I know that some readers are aware of the fact that Boncom is owned by Deseret Management Corporation (DMC), which is the Church's holding company for all of its for-profit businesses, and thus Boncom is ultimately owned by the Church. Some people have asked me the following questions about my new job, and I'd like to answer them generally here. Will your new job mean the end of your work on behalf of Mormon women? No, not at all. The work I do on behalf of Mormon women -- the Mormon Women Project, my book Women at Church, my speaking and interviews, my writing on this blog -- are entirely voluntary, extracurricular and have nothing to do with my day job. With my new job, I will still continue all of those activities and I'm grateful to have landed in a new place that is understanding and supportive of those efforts. 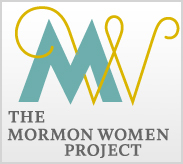 The Mormon Women Project will continue to publish interviews once a week (which is always my goal although not always accomplished). I will be doing limited speaking appearances through the year about Women at Church. I will continue to publish on this blog. I will continue advocating for the visibility, inclusion and voice of Mormon women as passionately as ever. I will not be writing another book this year, though! Why are you giving up your "insider" status as a church employee? Doesn't that help you in your work with women? The truth is that working for an external adversiting agency has never given me much of an "insider" look at the way the Church generally handles the women's conversation. I know a lot about the missionary department and a few other administrative departments in the Church, but the relationships and influences I've developed within the Church have mostly been at my own initation or by invitation, and I will continue to nurture these relationships personally. I've been grateful for the credibility Boncom has given me with church audiences and there's no doubt I've benefitted from being in the church administration network, but I feel like I'm well enough established in those circles to continue to be a trusted voice. Will any of your opinions about women in the Church change now that you're no longer working for a Church-owned company? At times, people have expressed the opinion that I take some of the positions I do -- especially pro-church positions -- because I am a "church employee" and my job is at stake if I say something challenging to the Church. This is not remotely true. Boncom employees do not have to have a temple recommend nor is there any ecclesiastical oversight. My stated opinions have always been my own and will not change. Why are you walking away from the opportunity to influence the Church from the inside? Again, I have been working for an external advertising agency that has the Church's Missionary department as a client, which means any influence I've had has been given as an external consultant. While I do feel that I've had an impact on some important projects, the majority of my voice and influence on church matters has been developed outside of my day job. While I've been grateful for the opportunity to share my ideas and suggestions on some Church-related projects, taking on a new challenge is exactly what I need at this time of my life. Again, I will continue the bulk of the work that is most important to me in the women's sphere, but with my new involvement with Brain Chase I'll be pushing forward my career in exciting ways that are right for me now. I feel very blessed to have spent the past four and a half years at Boncom -- they took a chance on me as a young mom when I'd been out of the work force for a few years, and I've had a marvelous education there. I will always be deeply grateful for that. But I also feel blessed to be moving on to this new chapter. Thanks for your support. Fields of Blood: Religion and the History of Violence. By Karen Armstrong. It's hard to beat the former-nun-turned-formidable-historian whose work has defined our academic perceptions of God for almost a generation now. Does religion lead to violence? she asks in this new book. I'm only a few chapters into this but my thinking is already benefitting from thinking as religion as a structure that is useful in giving meaning to our existence, but that violence is a distortion of the search for meaning, not a result of religion's own quest for meaning. Way Below the Angels: The Pretty Clearly Troubled But Not Even Close to Tragic Confessions of a Real Live Mormon Missionary. By Craig Harline. I had the pleasure of speaking at Craig Harline's home a couple of weeks ago when he and his wife, Paula Kelly Harline (author of The Polygamous Wives Writing Club which I'll be reading next), hosted a discussion on my own book. Since my husband served his own mission in Western Europe where Harline served his, I expected this book to be a coming of age story set in the tedium and disillusionment of serving in that part of the world. And indeed it is a story of tedium and disillusionment, but it is also a story of illuminating moments, humorous episodes, dramatic maturing and self-realization. Harline's comedic rhetoric, which feels a little much to me at times, drives this missionary narative to a place of originality and freshness where no missionary narrative has gone before. Congrats on the new position, Neylan. Sounds like a great opportunity where you can maximize your skills. As a mom of six I have seen first hand the dearth of really good intellectual experiences for kids (even those that bill themselves as such), so it's a needed niche. Best to you in your new adventure. Congratulations Neylan! I wish you the best in your new job, it sounds very exciting! Woot woot, startups! Brain Chase sounds terrific. I'll look into it for my kids this summer. I just wish it would keep them occupied for more than one hour each day! Best of luck to you with this transition. Best wishes in your new venture. And thanks for mentioning "Fields of Blood"--it was just the sort of book I was looking for!